We heard from the producers. We heard from the actors. We even heard from the accountants. But it was finally time to hear from the host about the Oscars mix-up. Oscars host Jimmy Kimmel opened up Monday night's Jimmy Kimmel Live! with the inside story of what happened. "You know it's a strange night when the word envelope is trending on Twitter," Kimmel quipped. He called the final moments of the award show "the weirdest TV finale since Lost." "Except for the end, it was a lot of fun. It went very well. We were chugging along and then all of sudden, out of nowhere, it turned into one of those Maury Povich paternity test shows," Kimmel said. Kimmel explained he was supposed to end the show in a seat next to actor Matt Damon after Warren Beatty and Faye Dunaway announced the winner for Best Picture. "I want to make no mistake, whatever confusion there was about who won, Matt Damon lost," Kimmel said. However, moments after La La Land was announced as the winner, Kimmel and Damon saw something was up. Kimmel said he saw that the stage manager was on camera which was "very unusual." "Matt says, 'I think I heard the stage manager say they got the winner wrong,'" Kimmel said. But Kimmel figured the host would go on stage and clear it all up. "Then I remembered, I'm the host," Kimmel said. 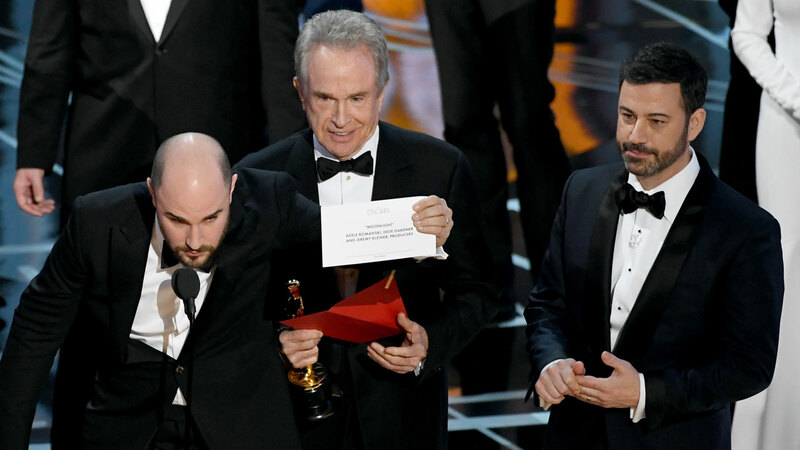 He then walked up the stairs as La La Land producer Jordan Horowitz announced, "There was a mistake. Moonlight, you guys won best picture." "Now there's mass confusion," Kimmel said. That's when Warren Beatty walked to the microphone to explain what happened. Kimmel said there were now producers from two movies on stage and nobody knew who was who. "I'm standing there like an idiot feeling bad for these guys, but also trying really hard not to laugh, to be honest," Kimmel said. Kimmel then noticed Denzel Washington pointing and trying to get his attention. "He yelled 'Barry!' Eventually I figure out that Barry Jenkins, the director of Moonlight is standing behind me and Denzel wants me to get him to the microphone to make a speech which made sense. Thank God Denzel was there to make sense," Kimmel said. Once the show ended, Kimmel said people went up to him asking if he pulled a prank. "I did not pull a prank. If I pulled a prank, I wouldn't have just had the wrong winner's name on the envelope, when they opened it, there would have been a Bed Bath & Beyond coupon. It was not a prank," Kimmel said. After the show, Kimmel, as "lead detective" spoke to Beatty about what exactly happened. Kimmel saw Beatty was still holding the Best Actress card. At the same time, Emma Stone was talking to the press saying she had the card. "She said she had the card, but I was with Warren and he had the card. It turns out they both had the card. For whatever reason, they have two of each card. There's a regular envelope and a backup envelope. Just to make it more confusing," Kimmel said. The accountants, as Kimmel pointed out, have apologized for the error. "It was quite an evening. It really was," Kimmel said.